The Rolls-Royce of juicing, Super Angel Twin Gear Juicer has gotten even better with the 2015 model upgrade. The most notable improvements were the inclusion of automated anti-jamming system and the type of metal used in the augers and extracting housing. Control panel, cooling systems, safety sensors, motor, and gearbox have also been upgraded and reinforced to comply with US electrical standards. This new model comes in three variants—Super Angel Pro, Super Angel Deluxe and Super Angel Premium Deluxe. Super Angel Pro is the most conservative and the cheapest of the three options. The body, extracting housing, and the two gears are made of high quality (304) food grade stainless steel. It doesn’t come with a complimentary soft fruit attachment. However, you can always get it as an upgrade in the future. This mid-priced variation is quite similar to Super Angel Pro in terms of the metal used in the extracting housing, twin gears, and the body. 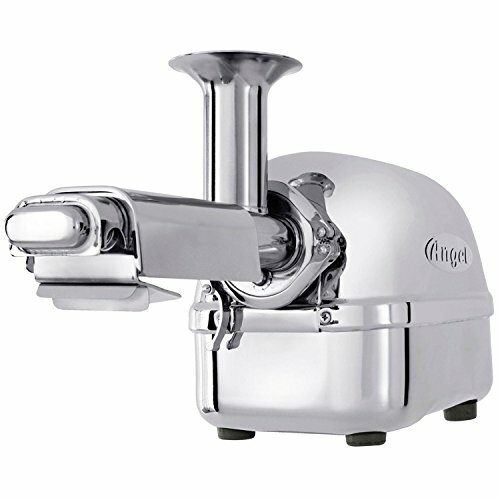 The only difference is it ships with the 304 stainless steel soft fruit attachment for making a puree. You’ll save a few bucks with this option than buying the soft fruit attachment separately. Though this model is the most expensive among the three options, the soft fruit attachment is not included in the package. What made this so pricey is the (316) surgical grade stainless steel used in the twin gear and extracting housing. Surgical grade stainless steel is not prone to mineral build-up which makes cleaning a whole lot easier. In a nutshell, here’s the difference between the three. The twin gear impeller system allows Super Angel 5500 to extract juice from any type of produce with extreme efficiency. There are three main issues that make its predecessor (Super Angel 5500) a little challenging to operate—it gets jammed when overloaded, it’s too slow, and you need to chop your fruits and veggies. Equipped with a new anti-jamming system, this 2015 model shouldn’t have any jamming issues after this upgrade. Juicing is still a slow process as you need to chop your fruits in a desired size for it to fit a narrow feeding chute and at 82 RPM you can’t really expect for it to process your produce quickly. Though it’s challenging and slow to operate, you’ll get the best tasting and the most nutritious juice out of this juicing machine. Unlike other juice makers, this doesn’t have huge parts to clean up so cleaning can be a breeze. All detachable components can go into your dishwasher. The most challenging part to clean up though is the screen housing but you can always use your premium cleaning brush included in the package to scrub hard to reach angles. According to some users, you shouldn’t leave the juicer unwashed otherwise you’ll have to deal with dried up residue which is more difficult to get rid of. Juice yield and juice quality are the ultimate selling point of this juicer. There’s absolutely no question about that. All parts that come in contact with your juice are high graded stainless steel, free from any plastic toxins. Its twin gears with a hairline gap make it possible to yield more juice than any other juice extractors. Revolving at 82 RPM, this juicer is perfectly slow to minimize oxidation or breakdown of nutrients. Last but not the least, it has a built-in cooling system to keep your juice fresh all the time. Because of this technology, juice extracted by Super Angel juicers are noticeably richer in color and tastes better. Plus, the shelf life of the freshly pressed juice can last up to 72 hours. This juicing machine can process any type of produce such as soft fruits, hard veggies, citrus fruits, green leafy vegetables, soy beans, and almond nuts. Hard produce such as pear, yakon, ginger, asparagus, bitter gourd, garlic, coconut, beets, pineapple, cucumber, celery, fennel, cauliflower, carrots, cilantro, apple, sweet potato, pumpkin, watermelon, pepper, turmeric, and broccoli. Citrus fruits like tangerine lime, mandarin, orange, pomegranate, grapefruit, and lemon. Dandelion greens, collard greens, spinach, parsley, peppermint, wheatgrass, beet greens, moringa, romaine lettuce, basil, spring onion, lettuce, brussels sprout, cabbage, pine tree needles, and kale are some of the leafy greens that it can process. Nuts and beans can be turned into milk using this electric juicer provided that you’ll follow the instructions in your product manual. Soft fruits including papaya, kiwifruit, strawberry, peach, tomato, blackberry, grapes, cranberries, mango, melon, and avocado can be turned into a puree if your model includes a soft fruit attachment. These attachments can turn your Super Angel Juicer into a grinder and puree machine. The bad news is you’ll have to purchase it separately if it’s not included in the model you picked. These new Super Angel Twin Gear Juice Extractor put the price in a more affordable range and the improvements made the juicing process a whole lot easier. Similar to my review of Super Angel 5500, operating this cold press juicer has a steep learning curve. It requires proper use and maintenance to keep it at its peak performance. If you take good care of this machine, you’ll continue to reap the reward of a healthy, refreshing and best tasting juice. Bottom line is, this triturating juicer is highly recommended for all serious juicers who have the budget.